Pleated vs. Woven Fiberglass Filters - RJ Kuhn, Inc.
What is the difference between a pleated filter and a woven fiberglass filter? First, there is the visual difference that you notice, the woven fiberglass filter is flat and will allow light to pass through it. It is many threads of fiberglass in a random woven pattern and is commonly found in the 1” and 2” thick varieties. These filters generally have a very low initial resistance rating to them, however, that changes fast as they start to gather dust and debris and this type of filter must be changed more frequently. They also tend to allow the finer particles to pass through due to the loose weave when first installed but will capture some of the finer particulate as they load up. As they load up, the resistance also builds thus limiting the performance of you blower and making your equipment run less efficient. 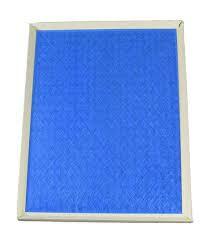 filters resistance as it collects particulate from the air stream by spreading it over a larger surface area. And because of the much tighter weave, they will collect finer particulate making them more efficient and they will last longer due to the greater surface area for the particulate to collect on. 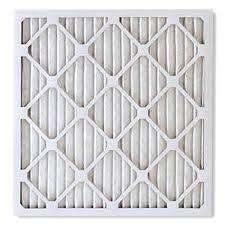 Regardless of the style filter you use, it is very important to maintain your filter to ensure proper air flow. If air flow is restricted beyond the allowable specifications, efficiency will be reduced, further restrictions may not permit enough air to pass over the heat exchanger and cause the high limit control to shut down the burner (home will not heat properly) and your circuit boards may over heat causing premature failure of some very expensive components. Most 1” and 2” thick filters, weather woven or pleated, cost under $5.00 but can cause hundreds of dollars in damages if neglected.